In the last week of September, the world entered a new paradigm, when the world leaders adopted the Sustainable Development Goals (SDGs) and committed to 17 goals that aim to eradicate poverty, promote peace and equity, fuel inclusive growth and protect the environment. An all encompassing and integrated agenda for the development of our societies. In the words of UNSG Ban Ki-moon, the 2030 Agenda for Sustainable Development and an agreement in Paris are mutually supportive and indispensable for the transition to a low-carbon and climate resilient world. The Climate Week in New York sent clear signals about the likelihood of an agreement to be reached at COP21.The momentum for change has never been stronger. Addressing United Nations and reaching out to billions of people across the world, Pope Francis underlined the moral responsibility to fight climate change, and 93 companies signed the WBCSD letter supporting his call. China announced its plans to start a national emission trading system to curb emissions for its most polluting industries. India foreshadowed its INDC reductions commitments accompanied by a significant expansion of renewables. States and regional governments committed to achieve GHG savings greater than the annual emissions of the United States. As governments continue to make emissions reductions commitments, business is stepping up to lead the transition to a low-carbon economy. 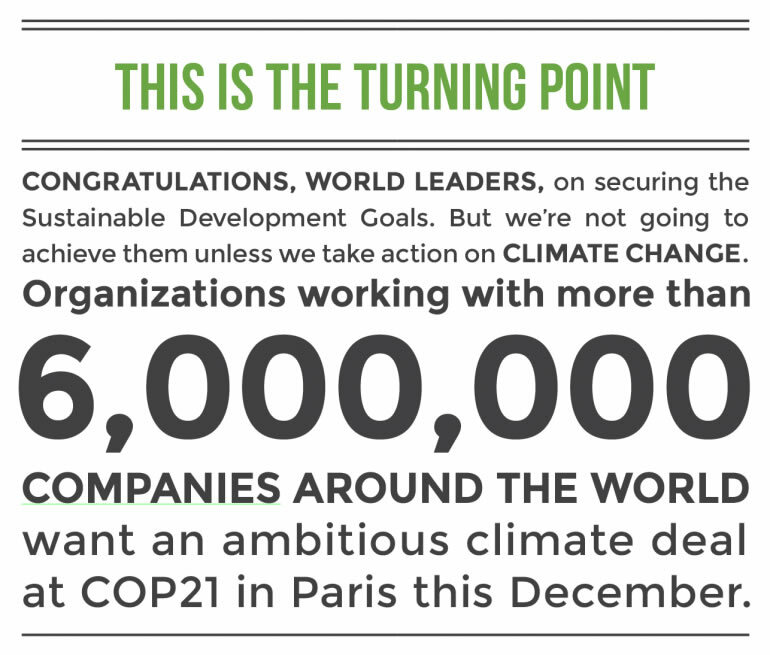 Through the coalition of We Mean Business, organizations working with more than 6,000,000 companies around the world expressed support for an ambitious climate agreement at COP21. The global movement to divest assets from fossil fuels reached US$ 2.6 trillion, reflecting the fast-growing worldwide drive towards clean energy. We have reached a turning point. The low-carbon economy is inevitable and change is in progress. Increasingly, forward-looking companies are taking ambitious measures to reduce their emissions and develop innovative solutions for global environmental and social challenges. 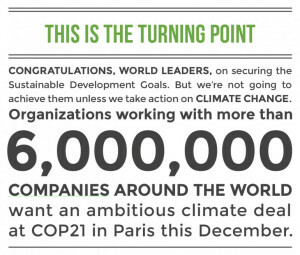 More than 140 companies are participating in the Low Carbon Technology Partnerships initiative (LCTPi) that is preparing 9 big business solutions for COP21. I sure hope you will consider adding your company to the list, if you have not already done so. The SDGs provide business with a comprehensive framework to address sustainability challenges. They represent a major opportunity for you to position your company for success in the emerging new economy. By aligning your strategy and operations with the SDGs, you can strengthen the company’s license to operate and capitalize on the new market opportunities and economic incentives that they bring. At the United Nations Private Sector Forum in New York, WBCSD launched the SDG Compass in partnership with United Nations Global Compact and Global Reporting Initiative. The SDG Compass explains how SDGs affect your business and offers you tools and guidance to measure and manage your contribution to the realization of the SDGs. The Forum featured innovative CEOs, including a number of WBCSD member companies, making ambitious commitments on action on SDGs as well as other prominent speakers such as UNSG Ban Ki-moon, German Chancellor Ms. Angela Merkel and U2 frontman Bono. As we celebrate the adoption of the SDGs by the world’s governments, it’s time for business to take bold action and contribute to the realization of the SDGs by bringing its resources, technological know-how and innovative solutions. We need to identify the exact measures and concrete next steps to implement the SDGs. None of the SDGs can be achieved in the absence of radical action on the ground. The adoption of a robust, balanced and universal climate agreement in Paris is a key element of achieving the SDGs. We must build on this momentum and increase our ambition through the Low Carbon Technology Partnerships initiative (LCTPi), to support governments and drive the transition to a low-carbon and sustainable world. I call on all CEOs to register for our events in Paris and continue our honest dialogue on how we can best achieve scale in implementing the sustainability agenda. Paris is where the essence of our work begins.